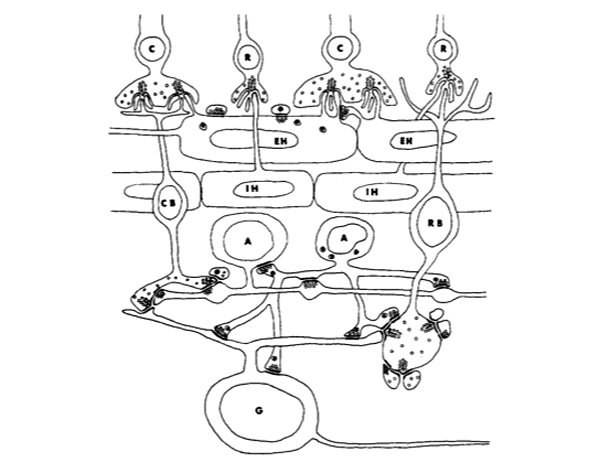 This paper, Synaptic Relationships in the Plexiform Layers of Carp Retina by Paul Witkovsky and John Dowling along with a previous one, Dowling and Boycott, 1966, began to set the stage for investigations into the circuitry of the inner plexiform layer (IPL) and it has only been fairly recently that this work been confirmed and extended. In the mammalian, the IPL is a complex of connectivity from over 15 types of bipolar cells, 27-30 types of amacrine cells and nominally 12-14 types of ganglion cells and the carp retina is more sophisticated with more cell classes and likely, more network connectivity graphs. For many years going back to the work of Cajal, the IPL was recognized as complex, but with an organization that reflected a gradient of connectivity. The important thing about this paper was it was fully 3 decades ahead of its time in the descriptions of nested feedback circuitry illustrated above from figure 17 in the paper. Nested feedback and more complex representations of retinal circuitry are often overlooked in retinal processing in favor of simpler feedback or feedforward topologies. More complex network topologies with nested feedback designs providing more optimized temporal performance than those circuits that use simple reciprocal feedback loops are now recognized as closer to reality, yet are still under-predicted. Fundamentally, this work came out of pure observational science. There is another entry stirring around in my head about the benefits of purely observational science and how that approach is under-appreciated in hypothesis driven science, but it will have to be for another time. For now, lets just say that the illumination of retinal networks, like many areas of science will only be brought about through the purity of looking to see what we find as there is no way to predict the networks given the complexity of neural systems. Just the simple example illustrated in the figure above with 2 amacrine cells and 11 synapses between them reveals over 2,048 different potential permutations of connectivity. Now, remember that there are over 60 cell types in the retina and many thousands of potential synaptic partnerships and you have the makings for billions of potential network topologies. The only way to discover how they are wired is to perform the observational research.